Stop! Hold it there! You miserable, lousy scoundrel. I swear upon my sword that you will not flee from Barcino without tipping me first. Yes, you, what are you staring at? Give me that black box with lightnings inside. Just one miserable denarius? You must be out of your mind? Oh, that's better, euros will be fine. 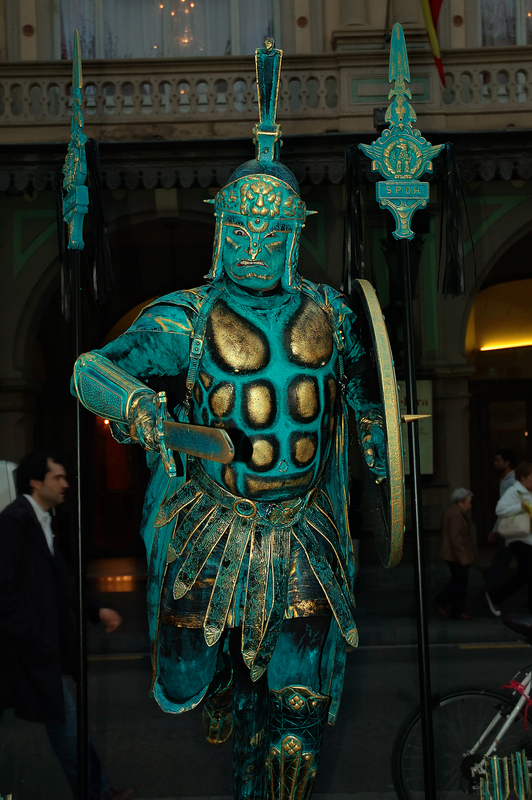 If you missed my previous post about this living statue please visit: Human Statue of Warrior at Las Ramblas de Barcelona. Aproveito e deixo-te os desejos de uma Santa Pascoa. Obrigado Daniel. Lo mismo te deseo.